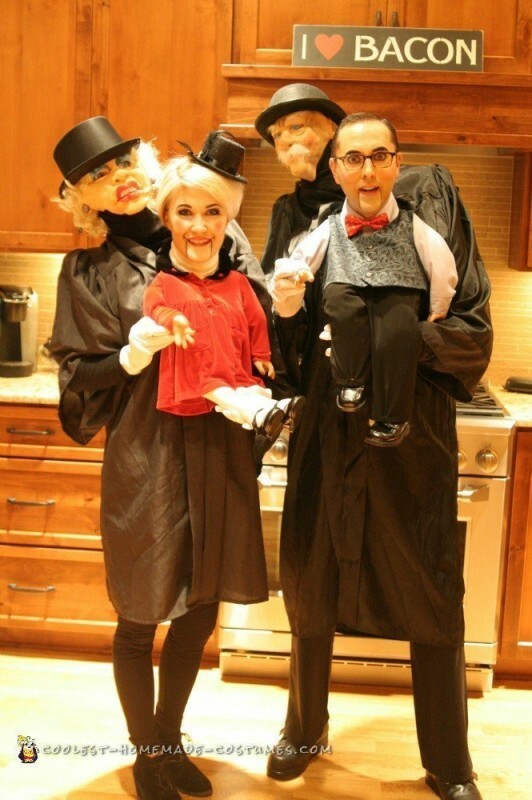 Ventriloquist dummy costume perfection! 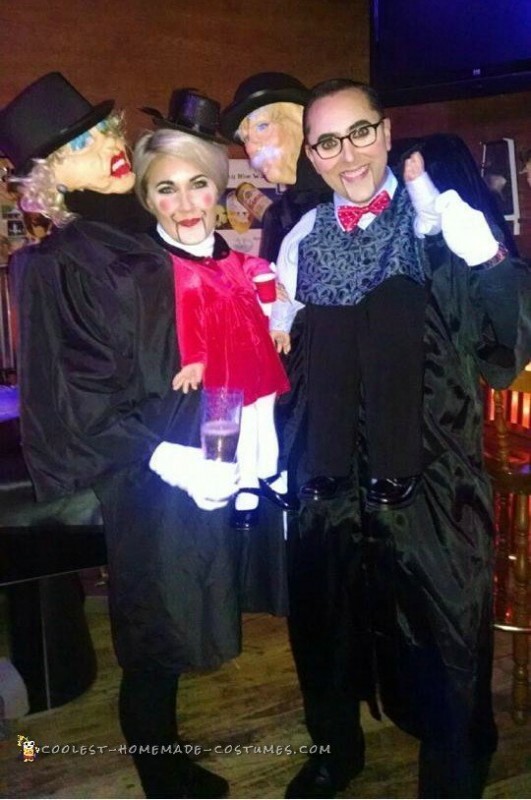 Our alter-egos, Jerry and Stella, are the product of our imaginations and HOURS of painstaking labor. They required patience, miles of Gorilla tape, two tubes of the world’s best adhesive, E6000 (banned in California but essential for Halloween costumes), Styrofoam, PVC pipes, straight pins, patience, and creativity. The key was to make Stella and Jerry look real. I started with wig heads and searched online for realistic looking people masks. Even my GO-TO, Amazon Prime, let me down, but after three different Goodwills, I hit the jackpot! Their eyes are MY eyes, printed on paper and taped to the heads. Jerry was easily straight pinned to the head but Stella took extra work, cutting, gluing, and adjusting her face to eliminate her original clown-like look. Their bodies started as my kids’ school backpacks. I mounted the wig heads on PVC pipe and carved a channel into a block of Styrofoam and then taped the heck out of them to stay at a crazy angle to make it look like they are peering out from behind us. Black turtlenecks and black graduation gowns (again, thank you Goodwill) with some carefully placed Velcro created the real person illusion. It took a couple of trials to get Stella and Jerry’s shoulders at the right size and angle but 100% worth the frustration, time, and extra foam and tape! 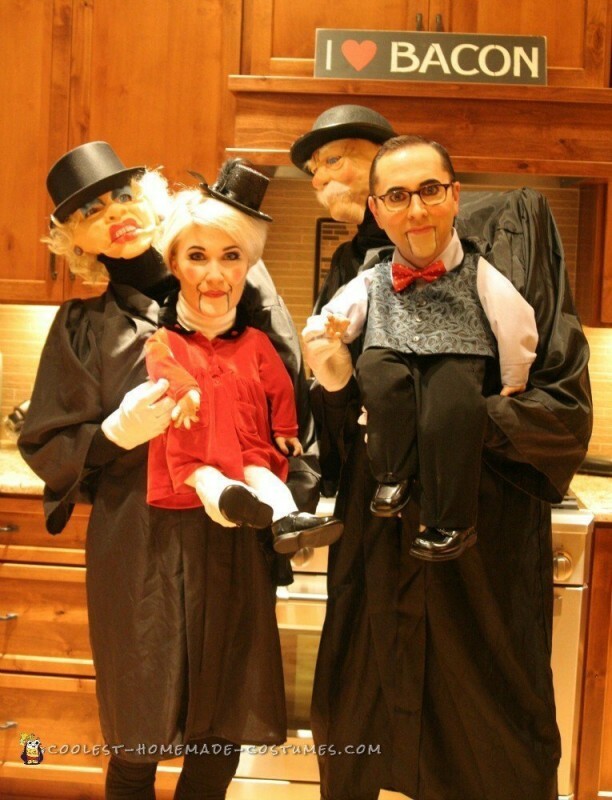 Our ventriloquist dummy bodies were fun and funny to create. I wanted them to be as real as possible. The hands were key. I LUCKED out and found a CREEPY monkey doll at Goodwill. His feet and hands looked like little baby hands. I cut that poor monkey/s arms and legs off right away. For Jerry’s boy doll, I used a three piece suit (sized 2 year old toddler). I sewed and glued the hands into the arms, sewed the pants to the shirt, cut enough of the shirt out for it to slide up under my husband’s neck. Then I used stuffing to give the body some life. Oh! And his shoes. I found a blue dress shirt for my husband that matched the color of the toddler shirt so that it would appear seamless. For Stella’s girl doll, I started with a red dress, added the realistic hands, and then created a body out of baby tights, stuffing, and toddler MaryJane shoes. The dress required some modification to keep the legs in place, and to fit around my neck. I used a white turtleneck for myself. Our actual arms had to be in black to look like the Ventriloquists’ arms (I had to add length to the sleeves on the graduation gowns). I cut the arms off my white turtleneck and the blue sleeves off my husband’s button down so that you could only see the black (plus we wouldn’t burn up underneath all the layers). We added white gloves and a red bow tie. The devil is in the details! I attached hooks to the each side of the backpack straps up near our necks and eye-loops to the dummy bodies. That way we could take them off toward the end of the party. The final finishing touch was the ventriloquist dummy make-up. We did splurge and have it done and it was worth it. Our friends’ reactions were priceless! All night long people were constantly freaked out by how real it looked. Plus, my brother-in-law figured out that the mini red solo cups fit perfectly into the dummy hands. It was hilarious! When the party got rowdy and everyone started dancing, they all wanted to dance with “the dolls”! 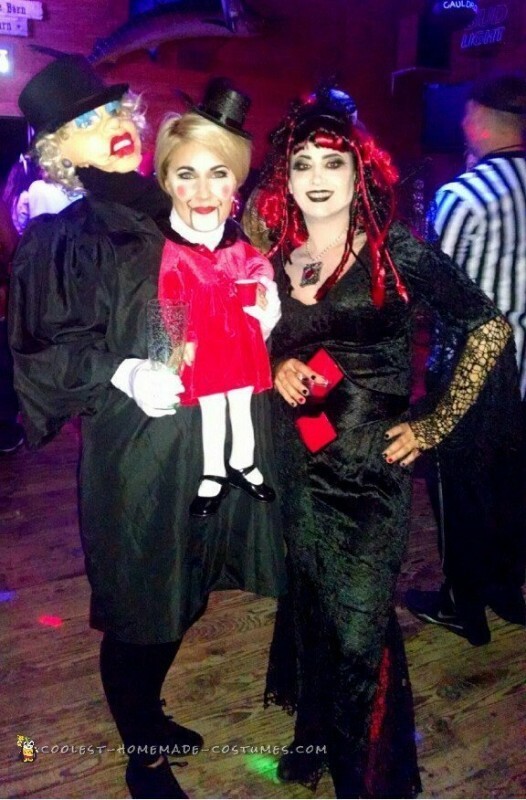 Everyone agreed it was one of our best costumes ever!